on February 27, 2018, 10:27 a.m. According to new data released today by YouGov BrandIndex, the UAE’s newest theme parks are making their biggest impression yet on consumers in 2018. After closing their first complete year of operation in 2017 with a huge leap in consumer brand advocacy, ground-breaking theme parks IMG Worlds of Adventure, LEGOLAND® Dubai and MOTIONGATE™ have all continued the trend to an even greater extent this year. YouGov BrandIndex tracks brand advocacy using Recommend scores, which are calculated by asking consumers, “Which of these brands would you recommend to a friend and which of these brands would you tell a friend to avoid?” Between 1 December 2017 and 21 February 2018, the Middle East’s only daily online brand tracker found that UAE consumers were increasingly likely to recommend the three brands to others. The brand with the biggest overall increase in brand advocacy is IMG Worlds of Adventure achieving a score of 17.4 on 13 February 2018, an impressive rise of 6.8 points in the past two months alone. The world’s largest indoor theme park was also the top brand improver in the YouGov BrandIndex 2017 Best Brand Rankings, increasing its Buzz score by 5.8 in the UAE Theme Parks and Water Parks category, ahead of LEGOLAND® Dubai in second and MOTIONGATE™ in third. The Best Brand Rankings are compiled using BrandIndex Buzz scores, which are calculated by asking consumers, “If you've heard anything about the brand in the last two weeks, through advertising, news or word of mouth, was it positive or negative?”. MOTIONGATE™, the Middle East’s largest Hollywood inspired theme park is also making giant strides in UAE consumer advocacy with its highest Recommend score on record of 13.8 achieved on 21 February 2018, up 5 points within the past two months. 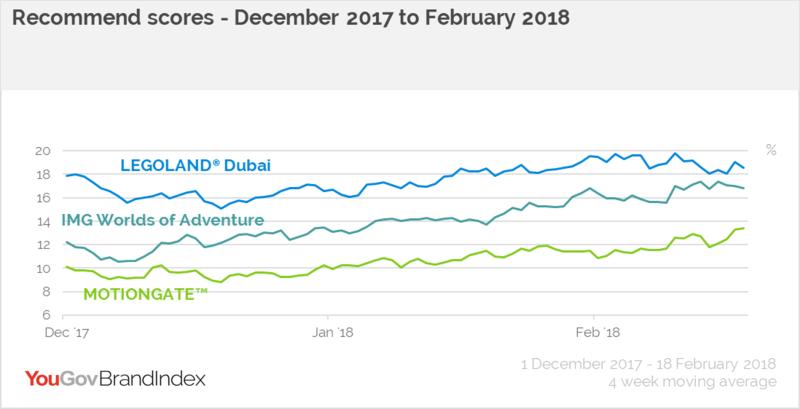 Following suit, and the most recommended brand of the three, is LEGOLAND® Dubai with its highest score to date of 19.9 recorded on 31 January 2018 rising 4.8 points since December 2017. The brand was also the fourth most positively perceived brand in the UAE Theme Parks and Water Parks category for 2017 in the YouGov BrandIndex Best Brand Rankings. Buzz and Recommend are both net scores calculated by subtracting the percentage of negative responses for the brand from the percentage of positive responses for the brand. The scores range from -100 to 100.